If you're walking through the park or even just going about your day it's very likely that you'll see some cute squirrels! These fluffy friends are common in cities, and sometimes people keep them as pets. Whether you're interested in training a squirrel or maybe you want to know how to feed an orphaned baby squirrel, you should definitely learn how to tell if a squirrel has rabies. According to the Humane Society, rabies is a virus that attacks the central nervous system in mammals. Although cases are rare, once symptoms of the disease begin to appear, rabies is almost certainly fatal. The rabies virus is typically transmitted by the passing of saliva through bites or scratches. It is uncommon for squirrels to carry the virus, but it is important to know the signs of rabies so potential encounters can be avoided and you can stay safe. Do not approach any animal that you suspect is rabid. One of the simplest signs that a squirrel might have rabies is if it approaches you, reports the CDC. Squirrels in the wild have a strong instinctual aversion to humans and should never approach one. Even a wild squirrel conditioned to receive food from humans should exhibit a wariness to people because it should perceive them as a predator. When a squirrel approaches a human with no hesitation and no regard for its own safety, it is a strong indication that something is wrong with the animal, and an early sign that it could be infected with the rabies virus. Another way to discern if a squirrel has rabies is to monitor its habits and tendencies. This is a bit trickier because it involves watching a specific squirrel over a long period of time and noting its behavior, but the Humane Society recommends observing the animals in your backyard or nearby park and being aware if their behavior changes dramatically. If an otherwise calm squirrel that lives in your backyard suddenly starts exhibiting vicious or aggressive behavior toward other animals, it could indicate the presence of rabies. The key is to note any change in behavior that has come about suddenly. Once rabies reaches its latter stages it becomes much easier to diagnose. The CDC reports that rabid squirrels may randomly attack humans, other animals or inanimate objects. Their behavior will be wildly out of character and typically involves a loss of motor skills. 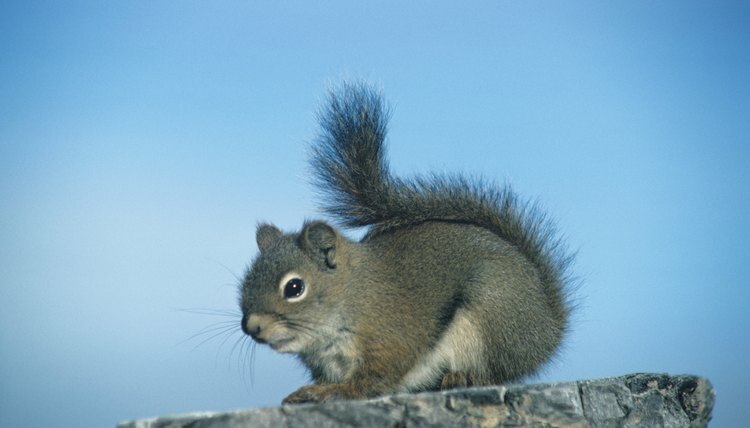 A rabies infected squirrel may have difficulty maintaining its balance and sense of direction, possibly running in circles. As rabies enters its final stages the symptoms become even more pronounced, according to the CDC. The squirrel may exhibit the classic symptom of "foaming" at the mouth. This occurs because the infected animal can no longer swallow its own saliva. In this final stage, complete disorientation, staggering movements, trembling and even paralysis may set in.